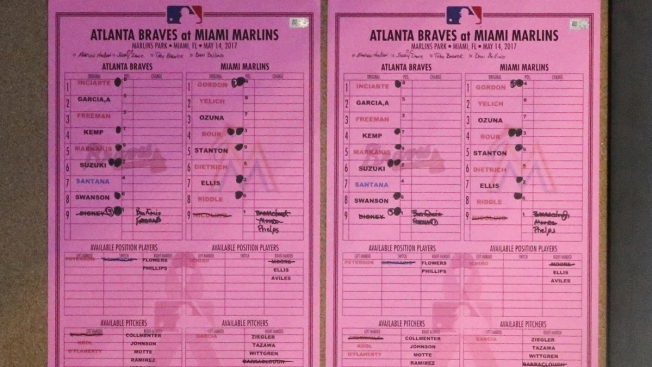 In this May 14, 2017, file photo, the lineups are displayed in the visitor's dugout during the eighth inning of a baseball game between the Miami Marlins and the Atlanta Braves in Miami. Major league teams this season must notify the commissioner’s office of their starting lineups before they are announced at stadiums. The decision Thursday, March 7, 2019, comes in response to the Supreme Court ruling that has led to more widespread legal gambling. Major league teams this season must notify the commissioner's office of their starting lineups before they are announced at stadiums. The decision Thursday comes in response to the Supreme Court ruling that has led to more widespread legal gambling.